What a joy! 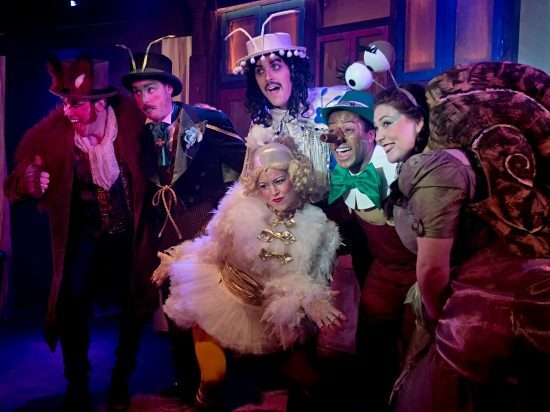 Pinocchio at Islington’s King’s Head Theatre is a new panto, but with all the, much-loved, elements of a traditional panto still intact: a baddie, a goody, a love story, wishes, songs, a chance to yell out “Oh no he isn’t” and the obligatory Taco Making Scene… WHAT!? Jiminy Cricket runs a flea circus, but he is in debt to the evil El Tabasco. So, when he discovers a puppet that can sing and dance, in a local pub, run by a snail called Michelle, he sees a way of reviving his flagging showbiz fortunes and of erasing the debt he owes El Tabasco. Thus is the story of Pinocchio! It is not as easy as you think to successfully do something new with panto. There are expectations to be dealt with and besides, not everyone agrees what actually makes a panto, but Charles Court Opera obviously do. So this is a new story of Pinocchio and it is a new way of doing panto. But the whole team obviously understand the panto genre because, as far as they have strayed from the bog-standard, run of the mill, QDOS panto, they have religiously stuck with the elements that have made panto work for such a long time. The quality of the cast and crew is obvious for everyone to see – you don’t normally get such quality of singing and acting and dancing in mainstream panto, where they are hampered by the talents of TOWIE stars, athletes and cbeebies presenters and they depend on click-tracks to mask the singing from the juves! This lot know when to be slick and professional and they know when to let down their hair and have a good time. The story is straight forward but the audience is never spoken down to. The wit is clever and, like all good family shows, entertains the whole family (no, honestly, that is not just a line from a press release: I would take my mates and my children to this Pinocchio). The singing is the best I have heard in a panto for a long time and the cast rip through wonderful versions of a multitude of popular songs including Spice Up Your Life, Bat Out of Hell, Bicycle Race and an excellent Abba medley, all brilliantly arranged and re-worded by Musical Director and lyricist, David Eaton. There is no Dame but, and I never thought I would say this, it doesn’t matter. Most of the comedy is provided by Robin Bailey who plays Pinocchio’s friend Fox and John Savournin who plays El Tabasco (and also directs and writes – in fact there are not many pages of the programme on which John’s name doesn’t appear). All of the actors engage, wonderfully, with the audience and deal with anything that is thrown at them: literally! There are a lot of “off-the-cuff” asides, the right amount of corpsing and other things that “go wrong”. I am not here to say whether they are scripted or not – I don’t really care: that’s not the point. Adding to the comedy is Matthew RJ Ward, as Jiminy, who becomes El Tabasco’s unwilling accomplice: wonderfully disarming, he is especially funny when he forced to disguise himself as a woman in order to help El Tabasco kidnap Pinocchio. Pinocchio is played with just the right amount of loveable enthusiasm by Joshua Da Costa who is the perfect boy-puppet. The love interest is provided by Michelle the snail (or Shelley to her friends) who is delightfully played by Francesca Fenech. Her comic timing is excellent and she is no mean tapper either. And, just when we think we have met the whole cast, up pops Nichola Jolley as the Spanish Wish Chicken! What a crazed, manic performance! Imagine a love child of Manuel, from Fawlty Towers, and Emu, on speed and you might come close! The set (William Fricker) and costumes (Mia Walldén) deserve special mention. The back wall cleverly hides a multitude of sliding doors and windows and I loved the simple palette used. I could have spent a long time watching Jiminy’s flea circus and the Dog Fish that befriends Pinocchio after he falls off his bike is absolutely beautiful and would grace any production. Messing with the traditions of panto can be a tricky business but, with 10 years of experience behind them, John Savournin and Charles Court Opera have got it right, proving that it is not what you do, but how you do it, that is important. The audience, mainly adults when I was there, easily joined in the fun, with the standard responses, food fights and custard pie throwing. There is an adult version of the show on certain nights – there are also some performances for the under fives – but we all enjoyed the family version just as much. I don’t know, if we fast forward 50 years, whether, like Roy Hudd in Mother Goose at Wilton’s, Savournin and Eaton will still be providing such exquisite Christmas entertainment, but I hope so. Pinocchio by John Savournin and David Eaton is at the King’s Head Theatre until 07 January 2017.